King Solomon in Bible said “My son, eat thou honey, for it is good”. Honey is an age-old elixir of life. It has nurtured us since time immemorial. Honey is that sweetness which is devoid of the harmful effects of normal sugar. The sweetness in honey comes from monosaccharide fructose and glucose, which may be almost as sweet as sugar. And not that it just tastes sweet; there are innumerable health benefits of honey on your health and well being, because of mineral, water, fiber and other antioxidants and antibacterial properties it contains. The sweetness in honey comes from monosaccharide fructose and glucose, which is almost as sweet as sugar. 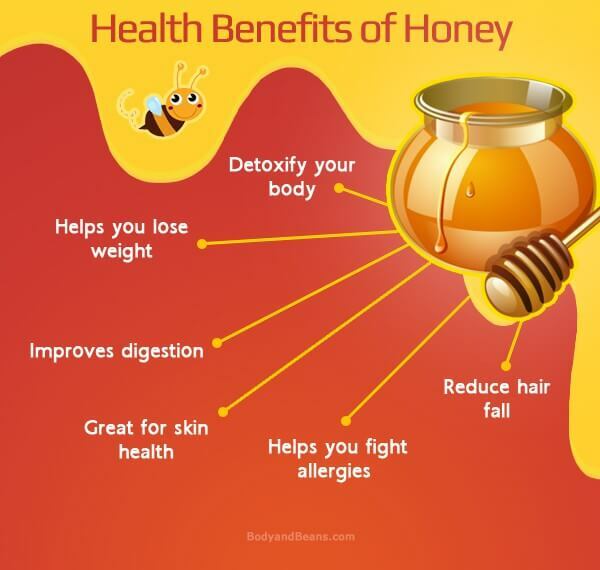 Honey is much more nutritious than the normal crystal Sugar and like Sugar, It does not use resources from our body to digest itself, rather it adds nutrition. In today’s post, we will discuss about varieties of honey and also about the most amazing benefits of honey on your health and well being. Honey has a history of over 8000 years. It has medicinal, spiritual and religious significances. Since ancient days, our ancestors have used honey to treat wounds, skin burns and allergies, for gastric and other disorders because of the antibacterial properties of honey. Before we move on to the benefits of honey, let me share some interesting facts about honey. In ancient Greek religion, honey is referred as “Food of Gods”. Even in Indian culture, honey is known as one of the five elixirs of life (panchamrit). If it is stored in air tight containers, then honey can remain fresh for thousands of years as most microorganisms do not grow in honey. During a nectar collection trip, a honey bee goes from 50 to up to 100 flowers. Honey is rich in vitamins, minerals, water, and also antioxidants which improve the functioning of brain. The colour and taste of the honey will depend on the flower from which the honey bee is collecting the nectar. Bees travel more than 2 million flowers to gather enough nectar for making just one pound honey. And finally, the flavor of the honey usually depends on the colour of the honey. The mild colour honey will have mild taste, while the darker honey will have more robust flavor. Why the honey taste so sweet? The sweetness of the honey comes from the monosaccharide fructose and glucose. In honey, the quantity of fructose predominates and so the honey tastes sweet. While, in some varieties the proportion of glucose is higher than fructose. The more the percentage of fructose, the sweeter is the honey. Well, there are about 300 varieties of honey, produced through various flowers. We will concentrate on few varieties of honey which are most commonly used by us. The National Honey Board has listed some of the major varieties of honey, according to the flower source, as mentioned below. Honey from avocado: Honey from the flowers of avocado plants tend to be darker in colours, and has a rich buttery taste. This is mainly used for salad dressing and sauces. Honey from alfaalfa: Honey from this flower is light coloured or even white, and is good for daily use. Honey from clover: This is the most common type of honey that is found on your table. You can use it on bread, cakes, and any other dishes. It is amber coloured and has a delicate taste. Blueberry honey: This kind of honey is extracted from blueberry flowers, it has well rounded flavor and amber coloured, it is used in sauces and baking. Buckwheat honey: Buckwheat honey has a distinct strong flavor, it is dark coloured, and is used in barbeque. We should thank honey bees for producing so many varieties and blessing us with this delight. There are innumerable health benefits of honey, from helping in maintaining ideal body weight to getting full sleep or to cure viral cold or other types of allergies, honey can be just magical. Eat it fresh, spread it on your bread or use it as a sweetener in tea or for cooking and baking. There are many ways to consume honey and it must be in your kitchen, because it has so many health benefits. Honey is used to cure allergies since ages. If you read the ingredients of your cough syrup, you will notice the presence of honey. Honey is often used in various medicines because honey has inflammatory properties which help in curing allergies. By consuming just one tablespoon of honey every day, you can prevent the allergens that cause runny nose and sore throats. Cough and cold, flu, allergies can be cured and also prevented by a daily dose of honey. As you know that honey has glucose and fructose. Both glucose and fructose can boost your energy level. In fact, the glucose in honey is absorbed by the honey quickly, and the fructose gets absorbed slowly. You get instant boost of energy due to fast absorption of glucose, and fructose keep you energetic the rest of the day as it gets absorbed slow. Also, a tablespoon of honey contains 64 Kcal, but it has no fat and cholesterol. Consumption of just one tablespoon of honey every day, can keep you energetic and active the whole day. Honey has antioxidants which keep the brain cells active, and you can boost your memory too. Down the long road, there are chances of suffering from dementia or Alzheimer’s, but consuming honey daily can keep these diseases far away. Honey is good for children above one year, and also the aged. While there are people who have a hard time waking up in the morning, there are others who suffer from insomnia or sleeplessness. If you are not able to have proper sleep at night, then your body will have low energy, you will feel weak and tired. But, if you have a proper sleep, then you will rise and shine in the morning. Honey helps in sleeping. The sweetness of the honey causes a rise in the level of insulin, this leads to releasing of neurotransmitter serotonin. The body converts the serotonin into melatonin, a chemical that helps in sleeping. Have some honey in the evening, and enjoy a good night’s sleep. It is always better to take recourse to natural methods, instead of using drugs and sleeping pills. Have you cut your finger while chopping the onion? Is your hand burnt from the hot oil while cooking? No problem, the honey kept in your kitchen can heal the pain easily. Honey is a natural medicine which can cure cuts, wounds and burns. Due to its natural healing capacities, it is often the first choice in these matters. Applying honey to the burns and wounds do not cause itchiness, so it is soothing. Honey has natural antibiotic properties which can disinfect the wounds from some bacteria. The most commonly used honey for treating the wounds is Manuka honey, extracted from Manuka flowers. Manuka honey can treat almost 250 kinds of harmful bacteria. The dry winter is on its way, and during these times the skin tends to lose moisture. Honey can help in retaining moisture in your entire body, including hair. Take a cotton wool, apply drops of honey on it, and apply it to your skin. You can wash it after 20 minutes and you will get a healthy and glowing skin. Add two tablespoons of honey in your shampoo, and this will prevent your hair from being frizzy. Though human body needs a certain amount of cholesterol, still high levels of cholesterol can be detrimental for your body. Accumulation of bad cholesterol can lead to heart problems, thyroid and diabetes. Honey has zero cholesterol; it has all the nutrients, vitamins and minerals, and antioxidants which help in binding the free radicals in the body. It is estimated that about 30 million people have inflamed sinus problems, and they are suffering a lot. Take one tablespoon of honey daily and you can see the reduced sinus within months. You will enjoy a good sleep, your pain will be reduced, and the credit goes to honey. Whether you are an adolescent or an adult, no one will like having acne and sunburns on the skin. Honey can work like magic to treat these skin problems. Apply raw honey on the affected areas; keep for 30 minutes and wash it off with cold water. You can add a teaspoon of honey on a half sliced lemon, and then rub the lemon well in affected areas. Do not get out in the sun after doing this, keep it for 15 minutes, and then wash off. Consuming honey daily can help in proper digestion, as honey has enzymes and antioxidants. The liver can break the food easily and digest the same; this is how honey reduces the chance of acidity and heartburn. Needless to say, you need to adopt healthy living habits to live a fit, healthy and longer life. But did you know, honey even if it tastes sweet, can help you keep your weight under control? Yes that true. Many people believe that it has sugar, but they forget that honey also have nutrients such as fiber, water, protein, vitamins and minerals. The crystal sugar does not have these vitamins or fiber and hence it uses the vitamins from our body to digest itself. But with honey, that’s not the case. If you are serious about weight gain, you may like to substitute your sugar intake or replace it with honey. Hangovers of the weekends can be very disturbing, but thankfully, honey can help you get rid of the hangover. Honey enables your liver to speed up the oxidation of alcohol, leading to the exit of toxins from your body. The headaches that you get in hangovers is caused due to the toxins present in the liver, honey speeds up the process, thus helping you in a great way. You can also drink a lot of water to get rid of the hangovers. Add one tablespoon of honey, two cups of orange juice, and one cup of yoghurt, mix it well, and drink up to get rid of the hangover. Due to the antimicrobial properties of honey, it is good for your oral health. Honey is believed to be good for treating gum diseases like dental plaque. Pain in gums, bad breath, plaque etc can be cured completely by honey. Drink the honey lemon water daily to improve oral health. There is no direct evidence of honey being used in curing cancer, but it certainly helps the patients, those who are undergoing radiation therapy or chemotherapy. Radiation therapy is usually applied on cancer patients. Due to its anti-carcinogen properties, honey can prevent the growth of tumors. Though further researches are yet to be done, still the initial results are promising. Consume honey daily, and keep the diseases at bay. What are the best ways to consume honey daily? Honey has fructose, so as you know anything in excess is not good and beneficial. You have to take honey in moderation so that you can enjoy the benefits well. Mix one tablespoon of honey, one tablespoon of lemon, in one cup of warm water. Drink it in the morning before having breakfast. You can add honey with green tea or any black tea. Replace sugar with a tablespoon of honey. Prepare a drink with two dash or cinnamon powder, one tablespoon of honey, lime juice and drink it. You can have honey in your breakfast, with bread and cakes too. But keep the quantity of honey in check. Do not go on eating huge quantities of honey every day. Honey is an awesome food that most of us eat and love. But there may be some risk of bacterial or fungal infection, especially for those who have weakened immune system and hence it is advised to be careful when consuming honey. Doctors suggest not giving honey to infants below 1 year as this may lead to botulism. You may also like to consult your doctor for further necessary details on consumption of honey. Daily consumption of honey is beneficial to you in a number of ways. You can eat it like a jam; use it as a sweetener in tea and other beverages, use in baking or preparing other types of sweet dishes and desserts. Honey is magical. Give it a try and share the benefits you are getting!